Blake Griffin was born in Oklahoma City, Oklahoma. After leading his high school to two state championships, he chose to play college basketball at the University of Oklahoma. For his sophomore year performance, Griffin swept all six of the national player of the year awards. That year, Griffin opted to enter the NBA draft and was selected as the first overall pick in 2009. 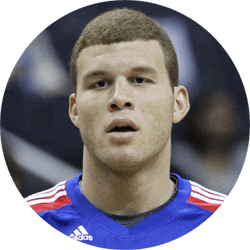 Griffin is an All-Star power forward for the Los Angeles Clippers who has gained popularity for his dominate dunks.